A walk at Tunnels Beach 9″x12″. What a fun painting day! Breaks included a swim in the pristine aquamarine water. This painting sold yesterday! 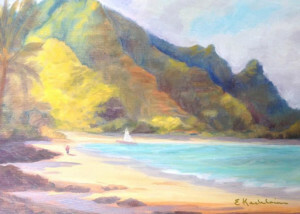 Today a couple, who collect art, came to purchase this painting and Waimea Wanderlust after seeing them two days ago. As the originals of both had sold in the interim; they special ordered the first giclees of both. They also went home with the hidden waterfall painting from the Mc Bryde Gardens. Mahalo to my newest collectors. A hui ho.